Micellar waters seem to having their moment in beauty lately and before the micellar water market became saturated there was Bioderma. 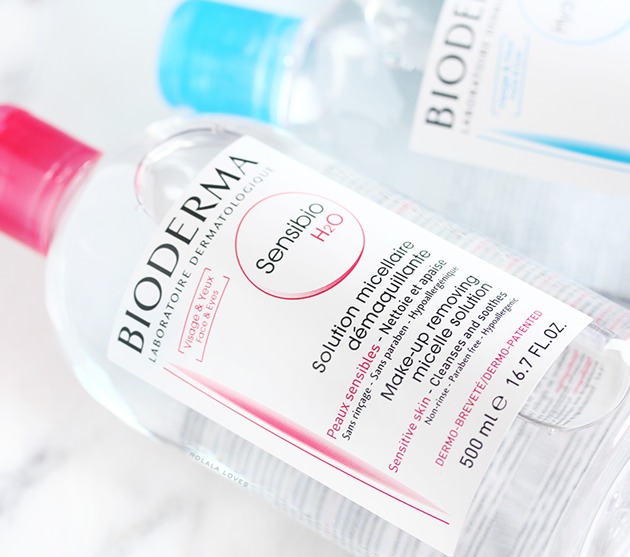 In fact there was a time when Bioderma Sensibio H2O was the "it" micellar water and it still remains well established both as a innovator and longstanding favorite with one bottle of Sensibio H2O sold around the world every two seconds! Micellar (pronounced my-sell-er) water is composed of purified soft water and mild surfactant oils. The suspended molecules form microscopic spheres called micelles, which draw out and dissolve dirt and oil when they come into contact with your skin. To use micellar water, you apply it to a cotton pad or cotton ball and swipe it across your skin to let it do it's thing. The micellar water will leave behind soft, cleansed and hydrated skin. Micellar water was first developed in France as an alternative to the region's harsh water supply. It became popular since it was a cleansing water that didn't require rinsing and helped Parisians to avoid using hard tap on their skin. Micellar waters have since become popular in the fashion and beauty industries among makeup artists and models as a means to quickly and effectively cleanse the skin without stripping it. In 1991, Bioderma perfected the formulation by creating fatty acid esters (the the constituent elements of micelles) that are biologically compatible with the phospholipids of skin cell membranes. This meant that their micellar water would cleanse while also rebalancing the skin. Micellar waters are a multi-tasking beauty product that can be used as a makeup remover, cleanser and moisturizer. Because they work so gently, micellar waters are ideal for all skin types. 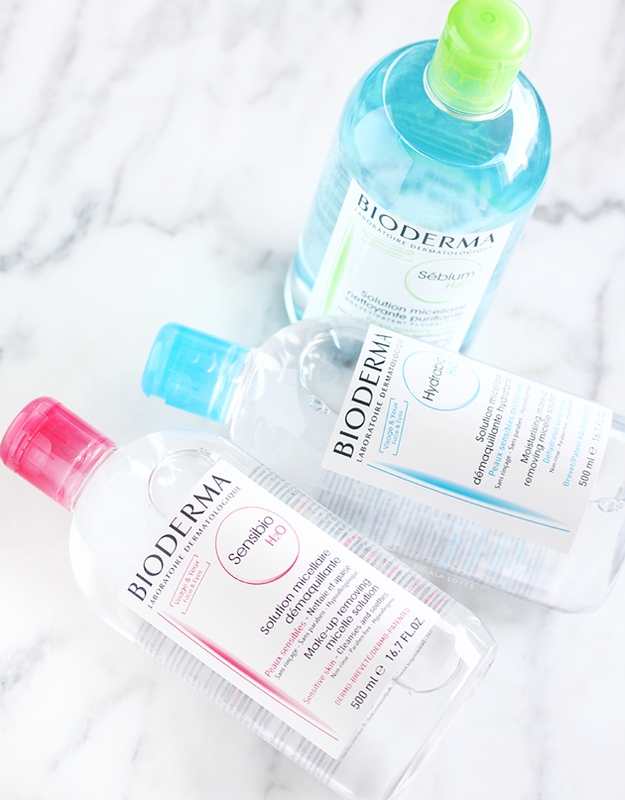 Bioderma is one of first and few brands that offer a range of micellar waters for different skin needs. It's no wonder it's a French pharmacy staple! All Bioderma products including this cult favorite were developed by skincare professionals. 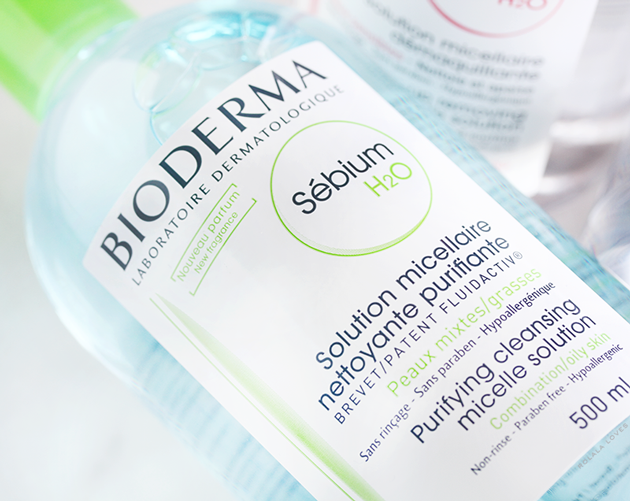 Geared towards sensitive and reactive skin types, Also known as Bioderma Créaline H2O, Housed in a clear, lightweight plastic bottle, Sensibio H2O It is formulated without any parabens, alcohol, fragrance or harsh chemicals. Out of the bottle the product pretty much looks and feels just like water. I use it with Muji Facial Soft Cut Unbleached Cotton Squares, made of organic cotton which feel like little clouds against your skin and actually hold the product you put on them instead of absorbing it all like most drugstore cotton balls do. The water has a cooling sensation on contact and I didn't have to do much other than swipe lightly around my face to remove my makeup. I was especially impressed with how little effort it took to remove all of my eye makeup. I will say that it is effective at taking off long wearing lip products and mascara, even waterproof mascara. After just one use, I could see why this product gets so much love. My skin felt clean, balanced and refreshed. This is a great quick cleanser/skin refresher and a great additional makeup removing step prior to double cleansing in the evenings. Hydrabio H2O is formulated for dry, sensitive skin types. It contains patented Aquagenium which stimulates the skin's natural moisturizing capacities by promoting the synthesis of two components naturally found in the skin to rebuild the moisture barrier and retain the water it needs to be balanced. Bioderma Hydrabio H2O looks and feels just like the Sensibio H2O with one distinguishing difference in that it has a scent. While it's mild and smells faintly like soap, it is there. It also works to effectively remove makeup in just one pass with one cotton pad. I think the Sensibio is slightly more effective on waterproof/long wearing makeup. My skin does feel a bit more hydrated compared to when using the Sensibio. That may have something to do with the Aquageium. This product also contains glycerin and niacinamide. I see myself using this one more during the colder months for sure. Sébium H2O is a purifying formula designed especially to address the needs of oily, acne-prone, and combination skin. With Fluidactiv, a patented complex, that regulates sebum quality to keep the pores from becoming clogged and clear up the skin and enriched with purifying agents, zinc gluconate and copper sulphate it works to cleanse without drying or stripping while regulating sebum production for a fresh, matte finish. I didn't try this one since I don't have oily skin but I did have my husband who does have oily skin give it try as a post cleansing toner and it does effectively rebalance the skin the skin while removing any traces of residue. My only previous experience with micellar water was when I tried the Koh Gen Doh Cleansing Spa Water and the Garnier Skin Active Micellar Cleansing Water. Neither product sold me on micellar waters. The former was unimpressive and the latter irritated my eyes and felt like it left a weird film on my skin. Having tried both the Bioderma and Garnier micellar cleansing waters, I don't feel that the Garnier is a full on dupe of the Bioderma. I mean it fulfills similar functions and is more affordable but they don't use the same ingredients and the Garnier product happens to contain polyaminopropyl biguanide (PHMB) a preservative that has been found to be potentially carcinogenic and allergenic. No thanks! 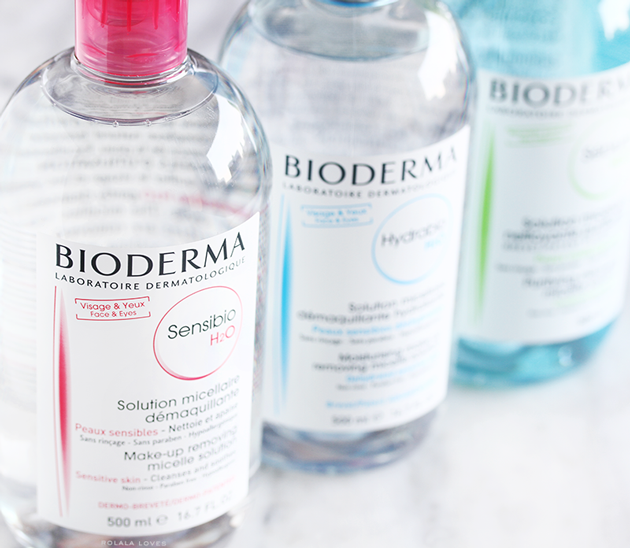 Bioderma has changed my mind about micellar cleansing waters and I've been switching between the Bioderma Sensibio H2O and Hydrabio H2O as my everyday makeup remover even after I finished up my testing period on them. The Sensibio narrowly edges out the Hydrabio as my favorite since it is scent-free and slightly more effective at makeup removal. 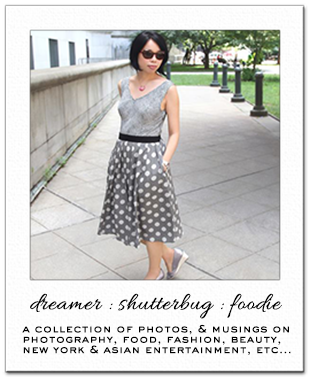 This is great for a midday refresh and it's ideal for travel as well. 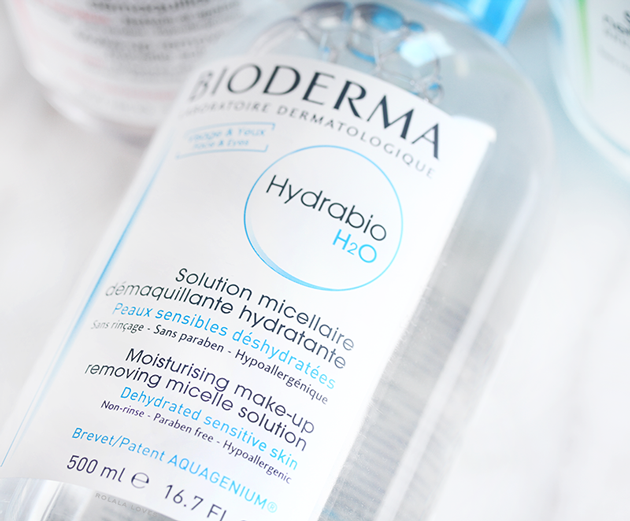 All three types of the Bioderma Micellar Waters can be purchased online from Beautylish for $16.90 each for the 500 mL size and $6.90 for the 100 mL size. Do you use micellar waters in your skincare routine? Have you tried any of the ones from Bioderma? Disclosure: This post features products received for editorial consideration and may contain affiliate or referral links. For more details about my product review policy, copyright, and information about affiliate links, please refer to the Policies page of this blog. Bioderma is a brand of very good quality, I read good reviews about it even though I have not tried their micellar water I am safely that good results are obtained! I've heard great things about Bioderma but I have yet to try it. I did try some micellar cleansing waters but I can't recall the brand. The packaging was pink, that's all I'm sure off. I just googled it and I think (based on the packaging) that Gardnier is the one I originally tried and I didn't like it at all. It irritated my skin and in the end I used it to clean the furniture. After reading your post, I'm considering trying another micellar water. I can see why they're very practical...they're easy to use and if they're right for the skin, then it is a win-win situation. Great brand and interesting product! Great brand I love it and also Garnier ones. I'm embarrassed to say this but I haven't tried any of these yet, despite all the raving reviews they get in the beauty world. I've only tried the pink Bioderma and while I like it I never repurchased as I find Garnier pink cap removes my makeup just as good. I only use micellar water as makeup remover so I am not fussy about the extra benefits. That said, Biorderma H2O seems like the perfect one for me. I tried this last year and it was ok to me. It removed all of my makeup, except my stubborn eye makeup. I prefer the Garnier micellar water. I really LOVE cleansing oils. It may be due to my dry & sensitive skin Rowena. Glad you & so many others have had success with this. I wanted to :( I will have to get those cotton squares you mentioned above! They look so good and I am not loving cotton balls anymore. LOL Excellent review! I'm glad you pointed out the different types, because many are unaware of this. I still find it so weird how this is so popular now but a few years ago, nobody had ever heard of it. I use micellar water basically every day now, ha. I love Micellar water and use it every night to remove my makeup. I know Bioderma is a great brand so I have to keep my eyes open for this now. I think I am using something like this from Neutrogena the description fits. I like it, and this brand sounds dam good though. I love their products :) I'ved tried Sensibio before and it works so well! Bioderma is still my fave out of all the miceallar water brands--I think a dozen--that I've tried. I am a big fan of Bioderma, I use the pink one for sensitive skin and am very happy with it. My favorite chap stick is by Bioderma as well, the Atoderm lips one. If you haven't already tried that one, give it a go, it's the best I've ever had. You can get it at Beautylish.com btw. I've been thinking about getting the Bioderma and it's nice to hear that it's worth out! ooh I didn't know Garner had that chemical - ugh! I'm tossing my samples! I love micellar waters! I haven't tried this one yet, but it looks so good! I have used both Garnier's and Bioderman's micellar water. I also prefer the latter and I have the impression that it does a better job in removing make up. I use an Etude House micellar water. It's really changed the game for me when I can't do my full skin routine. I've tried only the original bioderma micellar water.. I need to try the other 2 and see how it works on my skin. 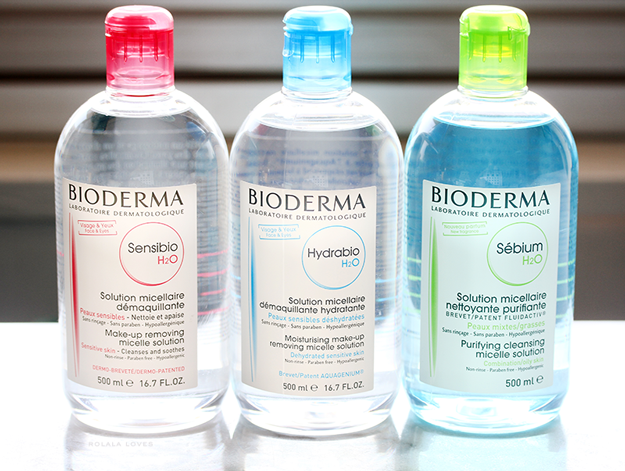 I'm in love with Bioderma micelle waters and the blue one is my fave. HG for me!